What is it about knives, especially pocket knives, that I find appealing? It has nothing to do with protection. It has nothing to do with monetary value. It doesn’t even have much to do with utility, beyond a few core functions. What, then, intrigues me about them? Why do I pause and gaze longingly at the collection when I pass a knife case in a hardware store? What possesses me to treat the loss of a knife as if it were important, as if it were meaningful? Questions, so many questions. The answers do not flow as easily. I think I carry a pocket knife because my father carried a knife. It may not be quite that simple and straightforward, though. I’m sure it has quite a lot to do with utility. I use my pocket knife. A lot. There’s always a piece of rope to cut, a pencil to sharpen, a page to cut out of a magazine, a piece of tape to cut, a bit of paint on a freshly-painted window to scrape off. Utility has a lot to do with it. But it started, I think, because my dad carried a knife. He didn’t talk to me about his pocket knife. He didn’t teach me that pocket knives are handy tools to carry around. Well, he didn’t teach me in a didactic way. But he taught me by example that knives are useful. And he always had a pocket knife with him. He died years ago, but I remember he always had his knife with him. 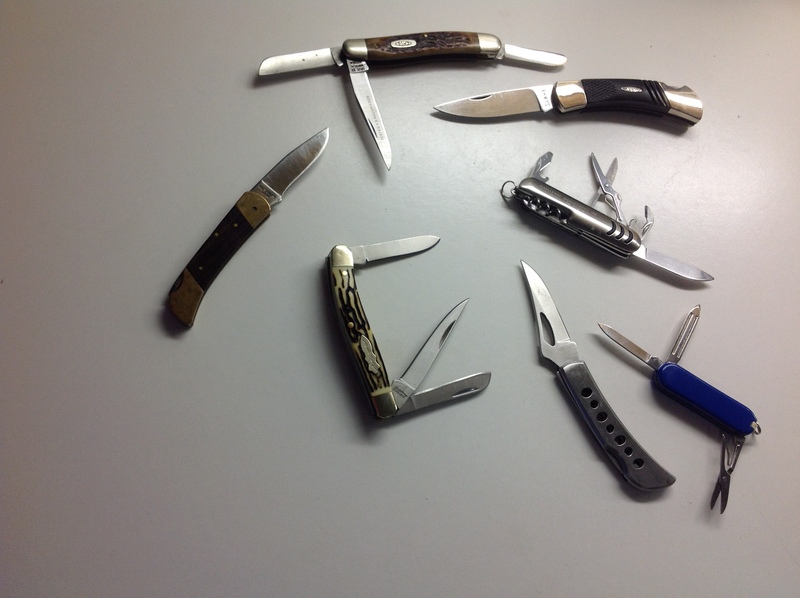 My father’s pocket knives were small, almost pen-knife in size, generally just one or two blades. Most of my knives are a bit larger, my favored style being the three-blade stockman knife, of which I now have two. I have others (all shown in the photo above), but my favorite is the stockman. When I lost my old Uncle Henry stockman to a hole in my pocket a few weeks ago, I felt naked. I hated that an old favorite was no longer with me. Obviously, I had other knives, including a very nice Case stockman, but I wanted the old Uncle Henry back. I picked up one of my old single-blade knives, one with an over-used and no-longer-functioning locking mechanism, so I had the requisite tool in my pocket (after the hole was repaired). But I really missed the Uncle Henry. And then, because the locking mechanism didn’t work, I bought another locking single-blade knife, all metal, to serve as my “everyday” knife for awhile. Every pair of my jeans, which I haven’t worn since March because of the hot weather, have a badly-worn watch pocket where I kept the old Uncle Henry stockman. The knife’s chiseled exterior wore down the denim quickly, making itself a nice, soft pouch in which to rest. I missed my Uncle Henry! So I went and bought one. But I haven’t been carrying it. It would break my heart to lose another one. Both my favorites, the Case and the Uncle Henry Stockman are safely put away. That attitude drives me crazy; it’s like my mother’s, who refused to use her beautiful crystal wine glasses except for very special occasions “because they might get broken.” Since she died many years ago, I’ve made it a point to use those wine glasses as “everyday” wine glasses. Until I lost that Uncle Henry, I treated my favorite knives the same way. Maybe, when it’s “jeans weather” again, I’ll entrust my Uncle Henry and my Case stockman knives to the worn watch pockets. Until then, though, I’ll keep a locking, single-blade knife in the pocket of my shorts. Several of the knives I own are ones I’ll rarely, if ever, use. Not because I treasure them and don’t want to use them, but because they’re not the kind of tools I find useful or helpful. I never use a pair of scissors that pops out of a knife. I won’t often open a bottle of wine with a corkscrew that folds into the body of a pocket knife. But, still, I won’t sell them or give them away. Why not? Because they’re knives. They’re knives. One doesn’t cast knives aside. Somehow, discarding a knife would dishonor my father. Maybe that’s what jolts me so much when I lose a treasured knife. This entry was posted in Family, Memories. Bookmark the permalink. John: You should be writing columns in the newspaper! I love this one! Do you follow the superstition that if someone give you a knife as a present, that you must give them some penny or dime as exchange — otherwise, it’s bad luck?